The Zoo, founded in 1924 and considered one of the largest gardens within the city, which according to the official Website (in Spanish), contains animal species from America (such as spider monkeys, parrots, macaws, jaguars, crocodiles, coatimundi, and a good selection of exotic snakes), Asia, and Africa, as well as common farm animals. The place also includes a playground for kids, restaurants, and some other recreational areas. It is small, but well maintained and beautifully set. Please click the following link to enjoy gorgeous photos by galasdeguatemala.com. The Handicrafts Market, which unlike the Central Market in the Historic Center, is dedicated completely to handicrafts and also unlike the Central Market, it is kind of a peaceful place. In general the prices here are a little bit higher; however, it is fair to acknowledge that most of the pieces we will find in this market are well selected, some of them from organized communities, such as the Proteje group, which is part of the Ixchel Museum. Photo by galasdeguatemala.com, used with authorization. 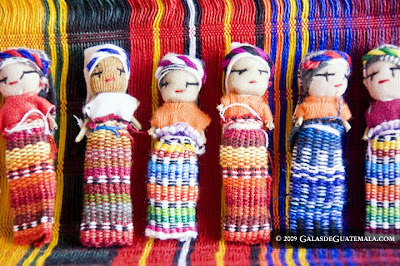 One of the most popular, cute and inexpensive souvenir you will find here are the world famous Worry Dolls (in Spanish, Munecas Quitapenas, which literally means "dolls that take your worries away). The dolls are usually packed in small bunches in tiny wooden vibrant-yellow-painted boxes. According to the folklore, the dolls are placed under the pillow before going to sleep to enjoy a pleasant dream, thanks to the dolls who are taking your worries away. Lovely story, isn't it? Around the corner, we will find the Children's Museum, where all of us, kids and the not so kids, will learn (or remember) many interesting things while having fun. The previous link will take you to the official Website of the museum (only in Spanish), a brilliant one I must add. The International Airport is also within the Finca La Aurora and, even though it plays an important role in our journey because it is the main port of entrance to Guatemala, I am just going to mention that is certified as Category I by the FAA and ranked No.1 in services and modernization in Central America. One of the features of this airport is that usually there is a marimba ensemble greeting arriving passengers with authentic marimba music. Click and enjoy the sounds of the Land of the Quetzal! If you like the museums, I mean the museums for grown-ups, please come back tomorrow. We will stop then at the Museum of Archaeology and Ethnology, and at the Museum of Contemporary Art.